WINNER UPDATE – Congratulations to Joan Anderson, Allison Smale, and Carla Hundley – this week three lucky winners! WIN WIN WIN Chameleon Color Tones AND Color Tops!!!! It is WHY NOT WIN WEDNESDAY! YAHOOO! We – super duper – love giving stuff away each and every Wednesday. This week the wonderful people over at Chameleon will be giving away THREE PRIZE PACKAGES!!!!! That is correct – THREE lucky winners will be receiving a prize package that includes both Chameleon Color Tone pens and Chameleon Color Tops!!!!! YABADABADOOO! Chameleon Color Tones are an innovative alcohol-based marker system whereby a single marker allows you to achieve multiple tones. You can create stunning highlights, dimension, shades, seamless blends, and gradations – with just one pen. With a diverse palette created by renowned artists and our own customers, the Chameleon palette covers everything from Primary to Nature and includes a unique Skin and Gray tones collection. With a range of 50 colors, the ability to get five or more tones from each pen and the capability to ‘overlay’ to create even more color tones, these 50 pens allow you to produce 100’s of color tones.And now Chameleon have introduced a new way to blend color, Chameleon Color Tops! Chameleon Color Tops are a new edition to the Chameleon Pens award winning patented system. The new Color Tops let users easily create smooth, seamless color-to-color blends. Traditional methods of blending colors with marker pens require multiple pen colors and a lot of skill, and can be quite time-consuming and laborious. With Chameleon’s new system, the process is quick and easy. Anybody can do it because the pen literally does the blending for you! Everybody needs to experience the awesomeness of Chameleon Color Tones and the incredibly easy to use Color Tops! Why not win a set! 2. Enter your name underneath this blog post. You have until Friday, Oct 12th at midnight to enter to win! 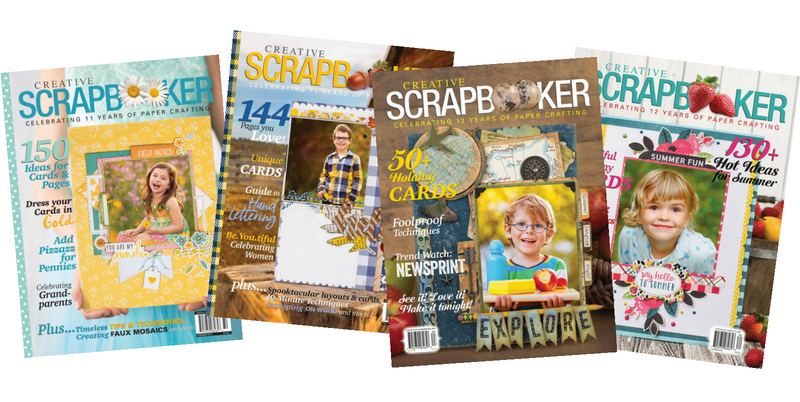 SUBSCRIBE TODAY to Creative Scrapbooker Magazine – Scrapbooking – Card Making – Stamping and MORE! I would love to try those. Thanks for the chance. Another lovely prize giveaway I have never tried these but love too. When I click on your link to Chaeleon I get “page not found”. I’ve tried four times. 😥☹️ Will try again later. Sorry about that Evelyn – the link seems to be working now. I’ve had my eye on these for a while. Awesome giveaway, thanks for the chance! This is a wonderful prize! Would love to win. Wow Chameleon pens! Love to try! I would love to try these. Thanks for keeping me up on all the greatest products and techniques! I’m getting “page not found” as well. wow i always wanted to have some. I have been wanting to try these out, but they seem to be *impossible* to find in my area! THIS has my correct email. Sorry! Went to chameleon site and entered message without link…. I have been wanting some of these. Thanks! I love these markers! I have o neutral pack that I use all the time but I need to add more to my collection. These pens are so cool! Thank you for a chance to win! I would love to win these pens and to try them out. They are such an AMAZING idea. OOOOOOO all the colors you could get! This would be awesome to win. I am just getting starting using different types of writing mediums. Like and followed. Thank you. I have wanted to try Chameleon pens since I first saw them. Thank you for the opportunity to win. Would love to win these! Have always wanted to try them! Wow! Would love to play with these! What a fun crafty prize! Would love to be able to try out these unique pens! Thanks for the chance to win this fab prize. Thanks to Chameleon & CSB for your generosity! Oh for the opportunity to try these lovely pens. Thanks for show casing and presenting the possibilities of Chameleon Pens. Wow this would be such an amazing prize to win! I have been really eyeing these pens for a long time! thank you so much for the chance! Would love the chance to work with the Chameleon markers! Fabulous prize; thanks so much for the chance to win these awesome pens. Thanks for the opportunity to win a great prize! OOPs…link looks like it is broken. Would love to try these markers! Thanks for the chance to win! I had trouble with the link above. So I did a search on FB and wasn’t sure which one to like & follow so I liked & followed both Chameleon Art Products and Chameleon Pens. I only have one Chameleon Pen, so it would be awesome to win one of the sets, as the green one I have is awesome to use. Wow! What a fabulous prize! Love Chameleon colors!!! Fingers crossed!!! Count me in for this awesome giveaway! Wow! great prize. THANKS FOR A CHANCE AT WINNING. Cool! Awesome pens! Thanks for the chance to win! Couldn’t get the link to work but I’ll go search and like on Facebook. Thanks for the chance to try these out! I’ve heard great things. Entering from Scrapfest. Hope I win. Thank you. I love Chameleons!They are so versatile! Was just thinking to myslef what more could a girl want…pens of course!!!! Love this chance to win such a great prize. ooo id love to try these out! TrinaMarie Anderson. Thanks for the chance! Woooooo hooooooo I LOVE COLOR!!! Thanks guys! I’ve been wanting to try these pens, and would love to win them! OMG!! I would so LOVE to have these pens! Thank you for the opportunity to win them! A great prize package that I would love to win. Thank you for the chance to win . Would love to try them. These would be amazing! My boyfriend loves drawing and designing.. these would be perfect for him! Another fabulous prize – you keep upping your own ante! Done, thanks for the opportunity. Always wanted to try these pens! These would be so exciting to try out! Excited for a chance to win! Omg you always have the best give always. Love to color and the Chameleon Pens would work so well. They look awesome!!! Thank you! Thanks for the chance to win, these look like fun pens! Wow!! I would love to win these pens. Thanks for giving us this chance. I’ve always wanted to try these pens. Thanks for the opportunity to win a set. My friends would be so jealous if I win this. Scrapbook Extra long weekend next weekend at my cottage….Cant’ wait !!! These look great! I would love to win them! Thanks for the chance to win. Would love to try these pens! So pretty 🌈!!! Thanks for the chance to win! Thanks for the chance at winning!! Thank you for the opportunity, they look like a great product. I already like and follow them – woohoo!! What a fun prize this would be to win. ❤❤❤ always the BEST giveaways! Hi Creative Scrapbooker! My name is Pamela Orr. I would love to win this prize to give to my daughter!! ❤️ Thank you!! Would love to win these! Thanks for the chance! Awesome giveaway. I’d love to give these pens a shot! Would love to try these pens! Wow! So exciting! I’m looking for some new matkoand these look fun! I love to win the pens. Would love to win a set of these pens! I would LOVE to try these markers!!! I would love the chance to try these out, I’ve seen them in action and they are amazing!! Thanks for the chance to win….I would love to try these pens out. Looks like fun! Fabulous markers…would love to grow my collection!!! Would love to win these pens! Been eyeing them for a while!! Thank you!! I could use these 🙂 thanks for the contest! This is an awesome give away! And I’d love to win! Thank you for running the giveaway! Followed! Sure would love these pens! These would be wonderful to use. Thank you so much. Love Chameleon! Thank you for the chance to win! What a fantastic giveaway!!! Would love a chance to try them out!! Thanks for the opportunity!! Awesome prize! I’ve always wanted to try these. Thanx CSM.
! Excited for the giveaway! Haven’t tried these pens before. Thanks Chameleon and CS magazine! Those look great. I would love to try them. Thanks for doing a fun giveaway! I would love to try these pens. I would love to give these a go! Thanks for the chance!! Would love to play with these pens!! Awesome prize! Thanks for the chance to win!! Thank you for this incredible opportunity to add more colour to my life and my scrapping! Ive seen this in art stores and really think I need them in my crafting space. Fingers crossed I get to play! Love to win those pens thanks for a chance to win! Been wanting to get some of these fascinating pens to share with my friend Jackie as we are cardmaking together. Another awesome prize. I would love to win. I would love these pens. Already like and follow their page. Thanks for the chance to win. Love trying new markers and pens. Thanks for the opportunity to win this awesome prize. The pens sound wonderful and thank you for the information and opportunity to win! Liked! Would love to win. I would really like to try these pens. Awesome pens! Love how the colors are so vibrant! These are amazing! Would love to win.